Is Seattle prepared for a major earthquake? The sight of the devastating quake and tsunami in Japan close on the heels of 2010’s catastrophic quake in Chile, another relatively rich, ostensibly prepared country, has many in the Northwest wondering how prepared their own cities and towns are for a major earthquake. The Cascadia Fault (or Cascadia subduction zone, to use the more precise term) runs just off the coast from the northernmost tip of Vancouver Island past Seattle and Portland down to northern California. Scientists believe this tectonic fault is capable of creating extremely large earthquakes, topping 9.0 on the Richter scale, and that there is about a 40% chance of such a mega-quake happening in the next 50 years. At the moment there is no way to predict the timing of such a quake, just that one is extremely likely. And because the fault is off-shore, a Cascadia mega-quake stands a strong chance of generating a large tsunami. 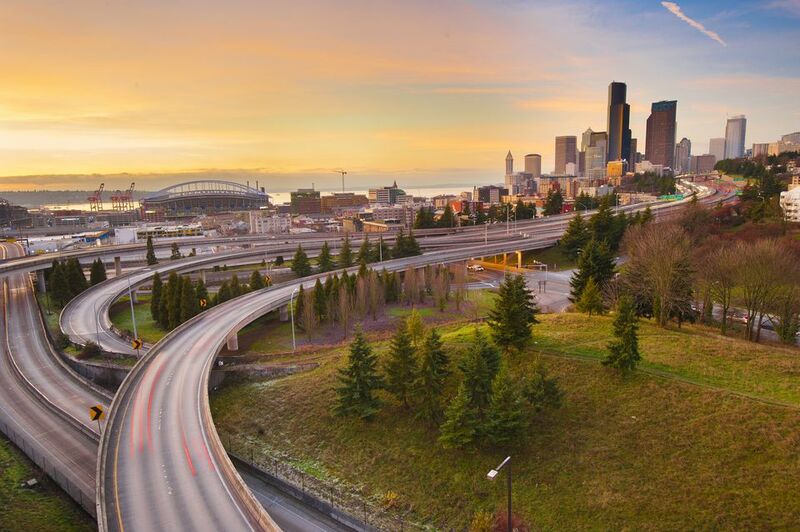 More recently, scientists discovered a smaller, shallow fault running directly under the city of Seattle itself, called the Seattle Fault. This fault is less likely to generate a mega-quake above 8.0 but could do more damage to Seattle due to its proximity. This fault is part of a network of shallow faults, including a Tacoma Fault and Olympia Fault, each posing its own dangers to different parts of the region. A mega-quake on the Cascadia fault could generate a tsunami up to 100 feet. While most of Seattle is elevated above 100 feet (30.48 m), a wave that large would wipe out coastal communities and destroy many low-lying bridges that connect Seattle with the outside world, potentially causing a humanitarian crisis as thousands could be left without food or fresh water for days. A less intense quake on the Seattle Fault could actually be more devastating to the city, due to the shallow depth of the fault and its immediate proximity to the city. One study predicted that a quake of just 7.0 on the Seattle Fault would destroy 80 bridges in the Seattle metro area. The study’s model calculated potential casualties of over 1,500 dead and 20,000 seriously injured. Major damage would occur to ferry terminals, port facilities, office buildings, and hospitals. The shaky Alaskan Way Viaduct would easily collapse. A major gasoline pipeline running through particularly unstable land in Renton could rupture. The portions of Seattle built on landfill (Pioneer Square and much of the waterfront) could see major devastation. In 2010, earthquake expert Peter Yanev wrote a scathing editorial in the New York Times singling out Seattle for being particularly poorly prepared for a major earthquake. He asserted that the lower frequency of large quakes in the Northwest led to more relaxed construction codes than cities like San Francisco and Los Angeles. According to Yanev, “Pacific Northwest cities are full of buildings with slender structural frames and fewer and smaller shear walls. In a mega-quake, many of the region’s iconic tall buildings would probably collapse.” Rob Witter, an Oregon geologist told The Oregonian, "The amount of devastation is going to be unbelievable. People aren’t going to be ready for this." The 2001 Nisqually earthquake acted as something of a wake-up call for Seattle, prompting energy to renovate the city’s most vulnerable buildings and structures. Harborview, the area’s primary trauma center, was retrofitted. New fire stations were built to a higher code level. And yet, ten years later the Alaskan Way Viaduct is still operational, the 520 floating bridge is still carrying thousands of cars per day, and the city suspended its renovation program for older brick buildings in 2008. The biggest obstacle is funding. Renovating every at-risk structure in the area would cost hundreds of millions of dollars. Property owners are unwilling to pay for the renovation and the state and local governments are cash-strapped. However, the cost of renovating is far lower than the expected economic cost of a Seattle Fault quake, in the ballpark of $33 billion. There are two primary dangers to Seattle residents, short-term and long-term. The short-term risk is the collapse of older brick buildings. Those residing or working in one of these buildings might want to consider a change of venue. Additionally, some neighborhoods are more at-risk than others: Pioneer Square, Georgetown, and Interbay are much more dangerous than Capitol Hill, Northgate, or Rainier Valley. The long-term threat isn’t immediate bodily harm but the likelihood that a major quake would break water lines and cut off roads that bring food into the city for days. Experts recommend assembling an emergency kit at your home that would sustain you with food, water, and first aid supplies for at least three days. The city of San Francisco created the excellent SF72.org which guides you through creating an emergency kit.